The rings made by Jason of Beverly Hills were designed to resemble NBA or NFL championship rings complete with the French National team logo and "World Champions" across the face. Speaking to reporters about the on Wednesday, he said: "It's a small gesture after winning a World Cup with great players. I consider them my family. It's a small gift from me." Juventus midfielder, Blaise Matuidi also took to Instagram to that Pogba for the ring. He wrote on Instagram: 'Unforgettable gift for an unforgettable memory. 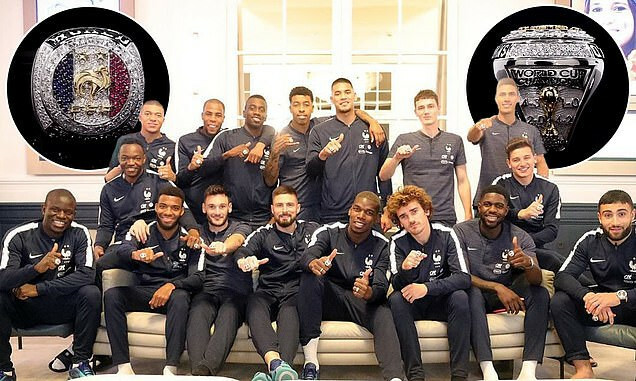 Thank you from the heart for the jewelry @paulpogba'.